A balanced meal that’s adult AND kid approved? Yes, please! 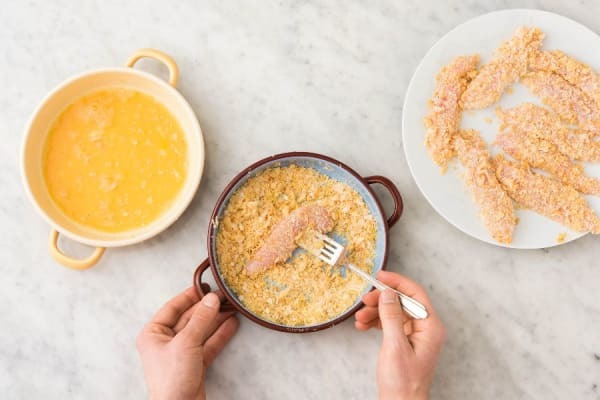 Our chefs opted to toast the panko to ensure it’s as crunchy as possible before combining it with Parmesan and using it to bread chicken-breast strips. After they’re baked to deep golden perfection in the oven alongside green beans and potato wedges, there’s nothing stopping everyone in your gang from gobbling it all right up. Wash and dry all produce. Preheat oven to 450 degrees, distributing racks evenly. 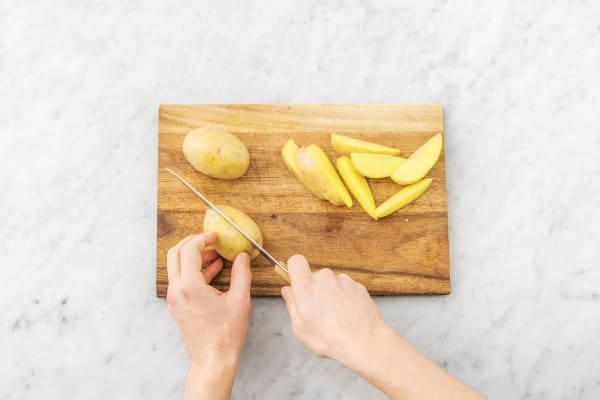 Cut potatoes into ½-inch-thick wedges (like steak fries). Spread panko on a baking sheet. Toast in oven until golden brown, 2-3 minutes. 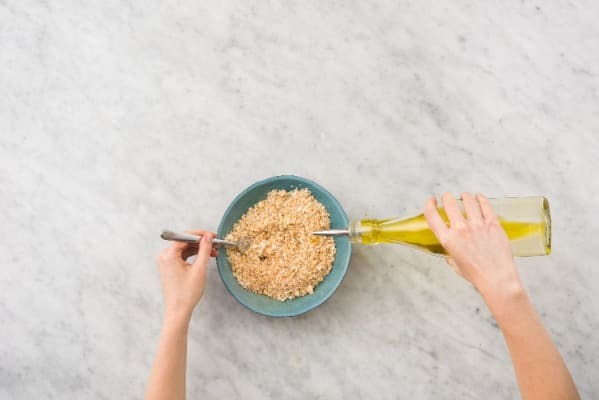 Transfer to a large bowl or shallow dish, then stir in Parmesan and a drizzle of olive oil. Season with salt and pepper. Toss together potatoes, a large drizzle of olive oil, rosemary, and a large pinch of salt and pepper on baking sheet used for panko. Bake in oven until nicely browned and crisp, 25-30 minutes, flipping halfway through. Cut chicken into 1-inch-wide strips. Season all over with salt and pepper. Crack eggs into a medium bowl and lightly beat. Working one piece at a time, dip chicken into eggs, letting excess drip off, then coat in crust mixture, pressing to adhere. 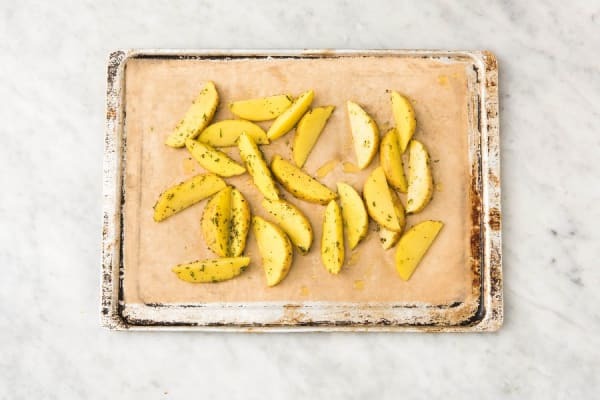 Place on a lightly oiled baking sheet. 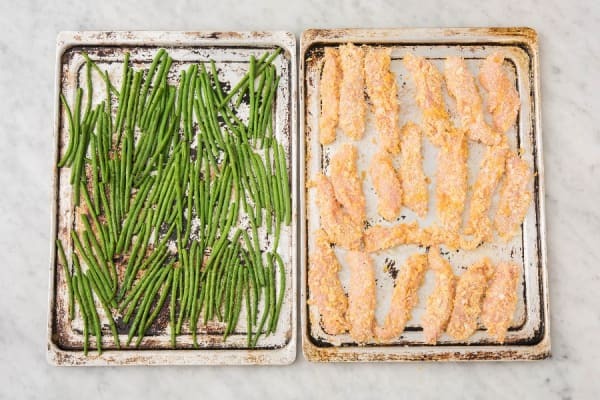 Toss green beans on a third baking sheet with a drizzle of olive oil and a pinch of salt and pepper. 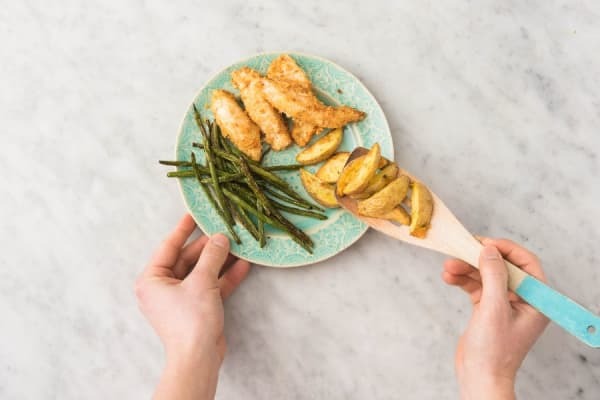 Bake green beans and chicken in oven until chicken is no longer pink in center and green beans are tender and slightly crisp at the edges, 12-15 minutes. Stir together honey and ¼ cup mustard (we sent more) in a small bowl. 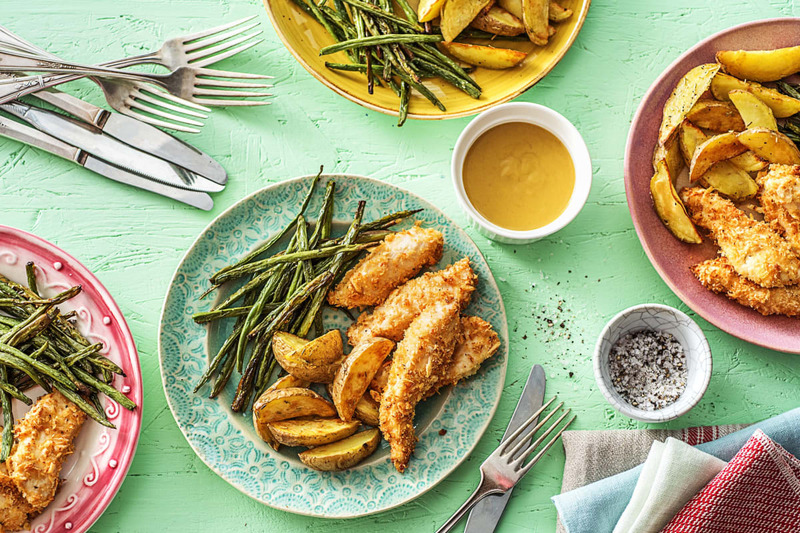 Divide chicken, potatoes, and green beans between plates. Serve with honey mustard sauce on the side for dipping.